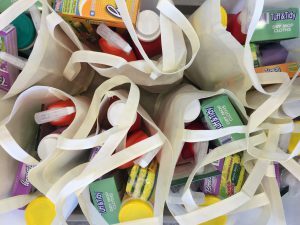 Birmingham-based law firm Maynard Cooper & Gale recently brought us several tote bags filled with household cleaning supplies we use every day at Ronald McDonald House Charities of Alabama. We are so grateful to them for thinking of us and think their project is a great example of how companies can get involved and help RMHCA! 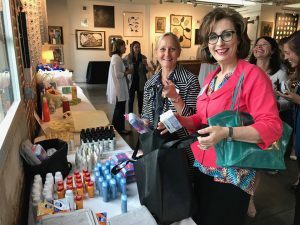 Maynard Cooper & Gale hosts several events each year as part of their Forum of Alabama Businesswomen and the focus of the most recent one was local charities, including RMHCA. While attendees learned about each charity, they were able to make an impact by filling tote bags with much-needed items. Host a community fundraiser. A jeans day or chili cook off are just two of the ways your office can help! Click here to learn how to partner with us on a community fundraiser. Hold a Wish List Drive Contest. Consider offering prizes for the individual or team who collects the most items. Click here for our Wish List. Donate tickets to family-friendly concerts, plays, and other special events. Our families love the chance to get out and have fun together! Make lunch or dinner at the House. Click here to learn more about being a meal volunteer. Collect pop tabs! Make it easy to collect them by setting a container or RMHCA pop tab house in your break room. Click here to learn more about our pop tab recycling program. Adopt a room or a family. When a company participates in this program, they guarantee a safe, comfortable space for families to stay while their child is receiving medical care. Click here to learn more.